A few days ago, I received the reward for backing the Kickstarter project I DRAW COMICS. I really liked the idea of creating a guide how to start drawing, showing you a few of the tricks the pros use during their day job. As this was Matt’s second project, there was a quite a chance to receive a high quality result out of the project. As this was my very first non-technical project backed, I was really interested in the outcome. If you are interested in the sketchbook as well, head over to their website, the sketchbook will be available for pre-order there soon. This entry was posted in meta and tagged meta on February 9, 2013 by andreas. Nowadays, a majority of modern life are numbers. Money you earn, money you spend, miles you drive, fly, run or ride by bike. There are many numbers you don’t make any use of. There are even more numbers you don’t think of. There are even numbers you don’t know of. At the very end it is about what you make out of these numbers. Some time ago I started to run various kinds of data analysis. For example, in 2012 I went 60 times to the gas station, spending 2774,77 € for gas. Never thought of it being that much. March was a crazy month, it seems I drove three to four times as much as in August where I used to be in vacation or October when I worked mainly from my home office. In November I started a new position, which might explain a new baseline around the 200 € mark – something I definitely should verify end of 2013. I thought I try to pick the cheapest gas station around, however I just realized more than half of the time I went straight to Total, which is just around the corner. This is a clear indicator to compare prices in the future more in detail as there are better prices than Total offers most of the times. It was not that hard to gather the data. Most effort went into how I should compare the data. Neither was the process of thinking about what the actual information might tell me that hard. However, it definitely shows you some ways of improvement for the future. This entry was posted in data and tagged data, meta on February 5, 2013 by andreas. A couple weeks ago, I started a new position as software development manager building a team for a new cloud based product dealing with big data. Evaluating various storage solutions we came along the SAP HANA database, an large-scale in–memory database with fascinating computing capabilities. Not only SAP HANA, all kinds of other great technologies sitting along the way waiting for being picked up on the upcoming journey. Changing the technology stack? Not really…. During my time at Microsoft Research, we investigated a lot of heterogeneous technologies, used them and developed even some. Beside C#, we used F# a lot, ANSI C, R as well and even ANTLR. We developed a new scripting language called Vedea fully compatible to the Processing syntax. Before we worked on visual languages for programming and worked with the CCR/DSS team on the concurrent programming models. One thing I’ve learned during my time at MSRC was not being narrow minded and not being freighted by technology. Our architect at MSRC once told me not being afraid of technology. It might take some time, maybe it is be not easy nor very convenient, however, someone built it, so you can figure it out. Time to change, or maybe not (yet)? This entry was posted in meta and tagged meta on January 31, 2013 by andreas. All together this makes 66.25% of spam. 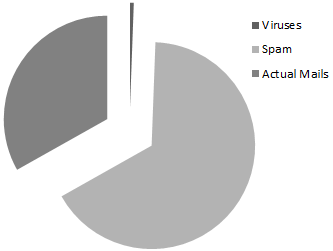 However, only 0,58% of processed mails included viruses, which is a quite surprisingly fact. Over the last year I encountered only two to five spam mails a day in my inbox, and I have not reported any false positive at all. In contrast, I pick up false positives in my GMX junk mailbox on a regular weekly base. For my personal mail server, I am using SpamAssassin with settings, I improved over two to three years as well as a set of various DNS blacklist. Quite a part of the regular mails origin from various mailing lists and newsletters which leaves me with about 60 mails a day to process. A number to be definitely improved (i.e. reduced) for 2012. This entry was posted in meta and tagged meta on January 28, 2012 by andreas. The last five years with Microsoft Research have been very intense, exciting but also quite exhausting. Our dev team went twice to the Microsoft TechFest showing the Microsoft Computational Science Studio in 2008 even to the press.I met Alan Alda, known as Capt. Benjamin Franklin “Hawkeye” Pierce from the TV drama M*A*S*H, meanwhile presenting us TV show Scientific American Frontiers. 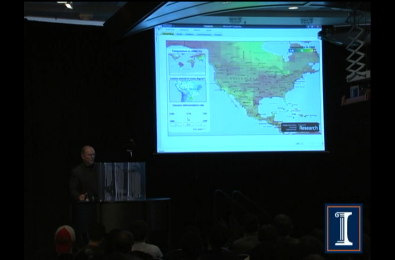 Ein Highlight bei der Entwicklung des Microsoft Computational Science Studio war zweifelsohne die Präsentation durch Craig Mundie während der Microsoft College Tour 2009. Nicht nur dass Craig Mundie hier meinen Code in den Händen hielt, er musste ihn auch gleich an einigen der Top-Universitäten in den USA vorzeigen (u.a. Cornell und Harvard). Das ist einmal eine ganz neue Art von Druck, bedenkt man, dass es sich dabei um einen Forschungsprototypen handelte. Auch hier gab es den einen oder anderen Artikel in der Presse, beispielsweise in der Seattle Times. Überraschend kam dann noch ein Channel 9 Video von dem niemand wirklich wusste, bis es plötzlich online war. Nachdem ich für Coding4Fun 2005 bereits das erste Mal auf der PDC05 mit einem eigenen Stand vertreten war, konnten wir 2009 wir dann auch mit Vedea auf der PDC09 punkten. Beide in Cambridge entwickelten Prototypen konnte ich Mitte diesen Jahres nochmals im kleinen Kreis bei der .NET User Group in Karlsruhe vorzeigen und habe mich dabei sehr über die interessanten Diskussionen gefreut. Zwei Mal auf der PDC, zwei mal auf dem TechFest ist keine üble Bilanz, die mit einer Danksagung im Artikel Predictive Models of Forest Dynamics im Fachmagazin Science (Science, vol 30, 13. Juni 2008) noch “aufgewertet” wurde. Zwischendurch gab es sogar ein Besuch von Bill Gates, dem einige der (Forschungs-) Arbeiten vorgestellt wurden (ich saß in dem Stuhl in dem Bill Gate saß). Aber auch das tägliche Leben ließ sich nicht Lumpen, ob eine Diskussion mit Don Syme (einer der brillantesten Köpfe und bekannt für Generics und F#) oder ein morgendliches “Hi Tony” zu Tony Hoare (jedem Informatikstudent aus dem ersten Semester aufgrund von Quicksort und dem Hoare-Kalküls wohlbekannt), das hat man nicht überall. Letztendlich konnten wir die eine oder andere Entwicklung an verschiedene Produktgruppen in Redmond weitergeben, und so findet sich vielleicht manch Zeile Code bald wieder in einem der zukünftigen Microsoft-Produkte. This entry was posted in meta and tagged meta, microsoft, microsoft research on December 3, 2010 by andreas. Following the idea of having clear HTTP URIs, I now extended my list of https://www.aheil.de/freebusy and https://www.aheil.de/software with my wishlist currently being with amazon: https://www.aheil.de/wishlist. What’s cool about this approach? At first it looks much better than http://www.amazon.de/gp/registry/Z5LA1EEWOT64 and is far more intuitive. Second, when moving to another country my wishlist URI stays the same, even when changing from amazon.de to amazon.co.uk. Finally, whatever happens to Amazon – I don’t care about my wishlist – my URI just stays the same. About 10 years ago, in 1998, I was a quite good customer of Telebuch.de, one of the very first German online bookstores before Amazon bought them and consequently all the URIs changed. This entry was posted in meta and tagged meta on June 19, 2008 by andreas.